Hello!! I am Alyssa (leedalangin). I'm a young lady studying animation, and my big dream is to work on really cute, inclusive cartoons for kids and young adults someday. In the meantime, I'm studying hard and trying to make cute art, fun crafts, and unique visual novels for everyone to enjoy. I focus on making illustrations of original characters, tiny mascots, my favorite video game/cartoon characters, and whatever else pops into my imagination. I've also recently taken up needle felting. Writing-wise, lately I'm focusing on writing visual novels, and I've been in the process of writing/illustrating/programming a dating sim called The Duenkhy for the last couple of years. In the future, I'd like to make more games, more needle felt dolls, art books, prints, stationery, stickers, pillows, keychains, tote bags, pins, notebooks, calendars, stamps, zines!!! !, charms, mouse pads, mugs, shirts... I want to try making all kinds of things!!! In return, I want to offer resources, art learning tips/materials, and other entertaining peeks into my working process, so please stick around and see what kinds of things I come up with! 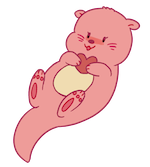 This lil otter wants YOU to support me on Patreon! First looks at WIPs and sketches! Special cutesy photos of my needle felts! Includes previous lower tier rewards! Patreon EXCLUSIVE access to beta builds and tests of the actual Duenkhy game!! Test routes before they're even done! One handwritten thank-you letter with a physical drawing I'll mail to you! Exclusive discounts on any products I produce, including free samples! One digital thank-you note and drawing! Includes previous lower tier rewards, except for the other $100 tier! WHY ARE YOU GIVIN ME THIS MUCH MONEY? I WILL MAKE YOU A NEEDLE FELT OF ANYTHING YOU WANT, HOPEFULLY ONCE A MONTH but it depends on the request complexity because I don't want my arms to die. Each month I'll produce paper-based products like stationery and prints, which will be announced and shown here first!